SINGAPORE, 18 December 2017 – Changi Airport Group (CAG) today celebrated the crossing of yet another milestone in Changi Airport’s history, recording 60 million passenger movements in 2017, a first in a calendar year. This achievement underpins Changi as one of the world’s major air hubs. A celebratory event was held in the transit area of Terminal 2 this afternoon with passengers on Scoot flight TR7 from Gold Coast, Australia – identified to be carrying the 60 millionth passenger for Changi Airport this year. 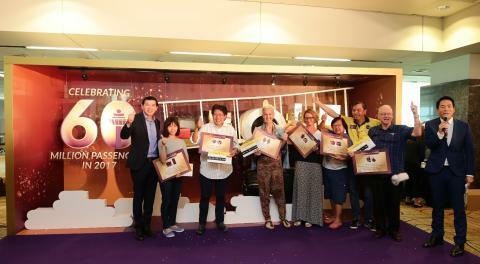 The event was attended by representatives from Changi Airport Group, Scoot and other airport partners. 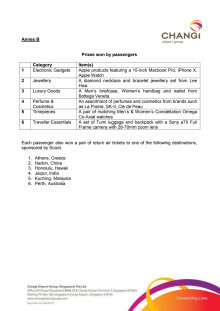 Prizes were given out to six lucky passengers on board TR7, who participated in a quiz game upon arrival in Changi Airport. These prizes were selected from Changi’s wide range of retail offerings, and included brand names like Apple, Bottega Veneta, Cle de Peau, La Prairie, Lee Hwa, Omega, SK-II, Sony and Tumi. The winners also each received a pair of round-trip tickets to selected Scoot destinations, including Honolulu and Athens. The flight’s passengers were treated to a buffet spread and received goodie bags (including a $60 Changi Gift Card). Ms Ang Bee Leng, a Singaporean, was the fastest of the six participants and won the prize of her choice – a set of Apple products. Back from a family holiday to Gold Coast with her family of five, the housewife was exhilarated with her win. "I was nervous on stage just now, but I am really happy to have won what I wanted. My family travels frequently on Scoot, but I had never thought I would win anything like this from a trip. I will be sharing the additional prize of the pair of air tickets to Jaipur with my husband for our next trip out!" Ms Karen Willis, who is currently residing in Australia, turns 50 tomorrow and is visiting Singapore with her husband to celebrate her birthday. Ms Willis was thrilled and all smiles when she shared, "While on our flight here, I was praying that I will be chosen as one of the six participants. I am so grateful for my win – this is the best birthday present for me. I love Changi Airport and while my husband and I have transited here separately many times, this is the first time we are spending time together in Singapore. This is indeed a lucky and special trip for me!" Ms Willis won for herself a pair of matching Men’s & Women’s Constellation Omega Co-Axial watches, and a pair of round-trip tickets to Honolulu. Changi Airport Group’s Chief Executive Officer, Mr Lee Seow Hiang said, “We commemorate an important milestone in 2017 with record passenger traffic of more than 60 million. It is a proud moment for all of us in the airport community and is the result of years of hard work and dedication to grow the Changi air hub to what it is today. It was only in 2012 that we marked our 50 million milestone. Five years on, we have increased annual traffic by 20 per cent or 10 million. 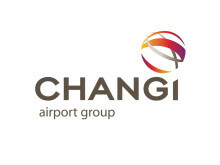 “We share this achievement with our airline partners who have shown their strong support for Changi Airport, adding capacity to their Singapore routes and expanding connectivity from Changi. We will continue to work closely with them to grow their business and operations in Singapore. With more than 60 million passengers now passing through Changi Airport yearly, the aviation sector will continue to be a key contributor to Singapore’s economy. It provides more than 160,000 jobs, and contributes 6 percent of Singapore’s GDP. The steady growth in aviation is expected to continue, with Asia as the centre of aviation growth in the next 20 years. For November, Singapore Changi Airport registered 5.17 million passenger movements, a 8.1% year-on-year growth. There was a 10.7% increase in airfreight throughput to 191,680 tonnes, while aircraft movements rose 4.8% to 31,140 landings and takeoffs. Passenger traffic for all regions grew at least 6%. All of Changi’s top 20 country markets recorded positive growth. Countries which achieved double digit growth include China, Myanmar, United Kingdom and United States. 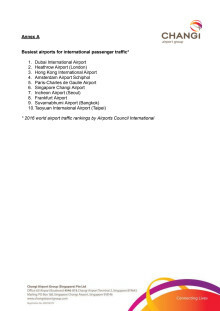 Among Changi’s top 20 routes, Phuket (+19%), Bangkok (+17%) and London (+14%) were the fastest growing. As at 1 December 2017, more than 100 airlines operate at Changi Airport, connecting Singapore to some 380 cities in about 90 countries and territories worldwide. With more than 7,000 weekly scheduled flights, an aircraft takes off or lands at Changi roughly once every 90 seconds. Changi Airport was the world’s sixth busiest airport for international traffic in 2016. See Annex A. A full list of prizes and destinations can be found in Annex B.
Changi Airport is the world's sixth busiest airport for international traffic.It served a record 58.7 million passengers from around the globe in 2016. Changi Airport has 400 retail and service stores, as well as 140 F&B outlets. With over 100 airlines providing connectivity to 380 cities worldwide, Changi Airport handles about 7,000 flights every week, or about one every 90 seconds.